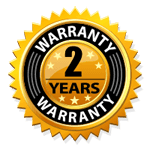 All of our work is guaranteed for two (2) full years against faulty workmanship. Concrete cracking may occur due to weather and/or clay conditions. Any use of corrosive salts will void our warranty. The most common question and the most common misconception about concrete is, “Will it crack?”. The answer is simple … PROBABLY YES, but this is normal. Read on to learn all about cracks and how the YERYK Concrete warranty works for you. Cracks are a natural consequence of exposure to the elements, and the curing process. There is no way to prevent or predict when and where a concrete slab may crack, and there is no minimum grace period or time limitation, a crack may appear within a day of a slab hardening, or after decades of undisturbed, unblemished surface. The trick is not in stopping the cracks, it’s about minimizing their impact. Begins with a firm and compacted base. Has consistent and correctly placed and/or anchored steel reinforcement, abundantly and appropriately gauged for the intended use. Is poured with concrete mixed to the correct strength for the intended use. Has enough depth of concrete to support the intended use. These are the industry-leading standard procedures that help prevent cracks from becoming breaks. The Difference Between Cracks and Breaks. A crack is a surface blemish only, it does not compromise the originally intended function, shape or grade of the slab. Cracks are unavoidable and are not covered by our two-year warranty policy. This is consistent with provincial guidelines set out by construction organizations in Manitoba such as the Manitoba Ready Mix Concrete Association (MRMCA), and the Manitoba New Home Warranty Program Workmanship and Material Reference Guide. A break is identified by a crack that has either opened into a significant void of 1/4 inch or more, or that is accompanied by either vertical or horizontal shifting. If natural wear and tear and exposure are able to exploit a crack into a break, that is a symptom of a defective product. Properly maintaining concrete can greatly extend the life and beauty of the concrete. Plain concrete should look clean and bright, instead of oil stained, dull and grimy. Cleaning your concrete driveway or sidewalk on occasion, and keeping it sealed are the best measures you can take to keep it looking its best. How often you clean and reseal will depend on the weather conditions the concrete is exposed to and the amount of vehicle traffic it receives. Generally, you should reseal a concrete driveway every two (2) years or so, or when the finish begins to show wear. How Do I Care For My Concrete In The Winter? You can help maintain concrete by shoveling the snow from your driveway, sidewalk, and steps. By keeping the snow cleared, there is less chance that it will compact down – eventually freezing into the surface that accelerates the freeze/thaw cycle. The less number of times that water enters concrete and freezes, the less likely that it will become damaged. Always use a plastic shovel instead of a metal one. Bent or sharp corners on a worn metal shovel will damage the surface of your concrete driveway or sidewalk. While a sealer will help to protect concrete from stain absorption, it is still a good idea to remove oil, gasoline, grease and other spills as soon as possible. If the concrete does discolor, pressure washing and certain cleaning chemicals will remove most stains. Using deicers on your concrete driveway in the winter can cause surface damage — primarily scaling and spalling, by forcing the thawing and refreezing cycle of moisture. Products containing ammonium nitrates and ammonium sulfates are especially harmful because they will actually attack the concrete chemically. Rock salt (sodium chloride) or calcium chloride will do less damage, but they can harm the vegetation and corrode metal. Avoid the use of any deicers the first winter after driveway placement, since new concrete is more susceptible to the harmful effects of salt. As an alternative, use sand or kitty litter for traction. Residential driveways are not meant to hold heavy vehicles and large equipment. Although concrete is one of the most durable paving materials for driveway construction, the typical residential driveway is not engineered to support heavy vehicles (like a large moving van), or huge construction equipment. Also, use care when plowing or shoveling your driveway and sidewalk. Avoid the use of metal blades that might scrape or scratch the surface. Again, we recommend the use of plastic snow shovels, scoops and/or pushers for snow clearing and removal. Concrete is the building material of choice for progressive builders, planners, and public officials in Canada and around the world. The concrete industry is well aware of the need to perform responsibly and do its part in helping to protect the planet and reduce adverse human impacts on the environment. The industry prides itself on its commitment to innovation and sustainable development. It takes less energy to produce concrete than it does to produce steel or wood according to a study conducted by the National Ready-Mixed Concrete Association and reported by the World Business Council for Sustainable Development. The production of cement — the primary ingredient of concrete — is responsible for 1.5% of Canada’s CO2 emissions, compared with 3% for the forest industry. Given the costs and challenges of shipping concrete, most concrete is produced very close to where it will be used. This reduces the need for fuel for transportation. Concrete is highly reflective. A high percentage of the light that hits concrete roads and walls is reflected, thereby helping to keep cities cooler and reduce the need for air conditioning. Heat moves very slowly through concrete walls and floors, thereby reducing swing in indoor temperatures. The industry increasingly uses waste products to the replace some of the conventional cement required in the production of concrete. The concrete industry has made important progress in its use of alternative fuels. The longevity and stability of concrete means that it requires less maintenance and it is rarely replaced. Manitoba’s best building solutions are concrete solutions. Relax, and leave your project to the experts.